Oh to be lost in space, exploring strange new worlds with a plethora of rocks. Lots and lots of space rocks. Enjoying the thrill of combat from dangerous, colourful and stinky creatures at your fuel tanks. Rescuing your fellow scientists, some unwillingly and others affected by the loneliness that is space. There's a lot to discover and do among the stars, and Nova-111 plots a puzzling sci-fi adventure course that's one strategic turn-based move at a time. 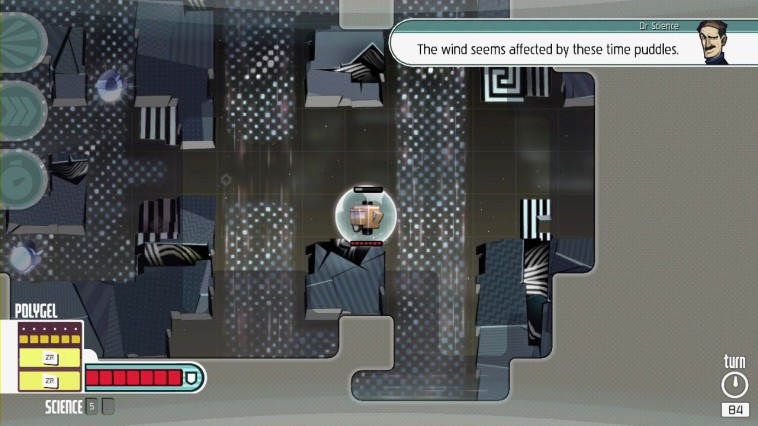 Nova-111 is a refreshing puzzle adventure in which you control an adorable ship avatar on a rescue mission, in search of fellow scientists that are scattered throughout certain areas in space. It's obvious something has gone awry, as the game drops you right into its crazy world in which it mixes turn-based movements for exploration and combat, with a little bit of real-time action too. It's a great combination that adds a lot of depth in gameplay, seamlessly transitioning between styles. Once you happen upon an enemy there's some inspired design - you approach them as they shadow your movements, looking for an opening to attack. It requires strategic planning on your part for initiating evasive maneuvers, deciding when to use your arsenal or simply attack with your ship by bumping into them. Enemies don't all act the same way, and there's variety to the ones you will encounter. Sometimes they'll arrive in groups, sometimes one at a time - each requires thought on how to destroy them; you're rewarded for quick dispatches or destroying multiples, and combat can be a challenge. Each have different attacks spanning one or more spaces, keeping the game fresh, while others surprise by acting in real time. It's not the only way in which real time play creeps up on you, as the environment will also react this way in certain areas, forcing you to think quickly. Nova-111 tracks your every move with a turn-counter. It can take as few moves as possible to explore an entire area or lead you into the hundreds. The game also times your progress, and for every zone (each with different areas that make up the whole) completed it tallies your successful rescues, secrets discovered, time taken and moves to complete a mission - and then you are letter graded for your performance. The grading feature doesn't take away from the enjoyment of exploring, and you'll want to do just that to find every possibility and secret the game is hiding. As you explore the map which is viewable on the GamePad - you can switch play from TV to the GamePad albeit without touch controls - will mark areas of interest, objects and enemies. These markers do not necessarily make the game easier when it comes to figuring out possible puzzles in how to get to certain areas, but they can help as guides to let you know what objects and enemies you can interact with. Even with the map it's very easy to forget it's there, as it's clear to just see what things await your ship once you enter an area. There are still surprises behind rocks you can see and break through, so don't worry that the game gives everything away. In fact, sometimes it'll tease you by showing you a scientist or area you need to get to but it'll take some trekking and puzzle solving to get there, as direct routes aren't always available. 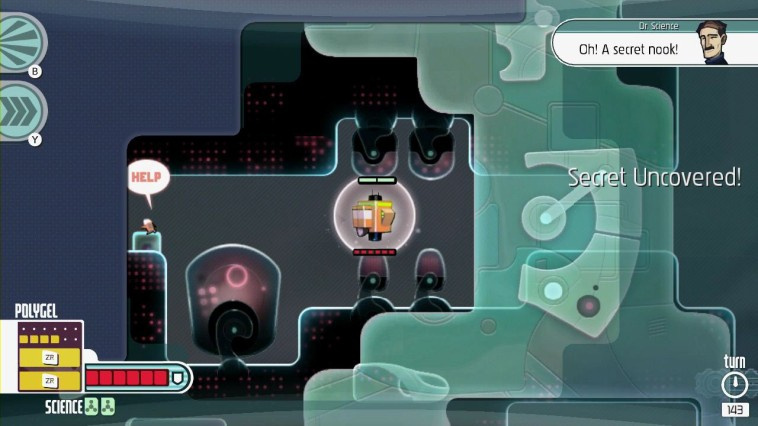 Various nooks and crannies contain hidden items which are usually parts to expand your ship's max health, refills for bombs, or scientists to rescue. As the game progresses upgrades unlock for your ship which include a laser beam, bombs and the ability to phase through certain terrains and enemies. 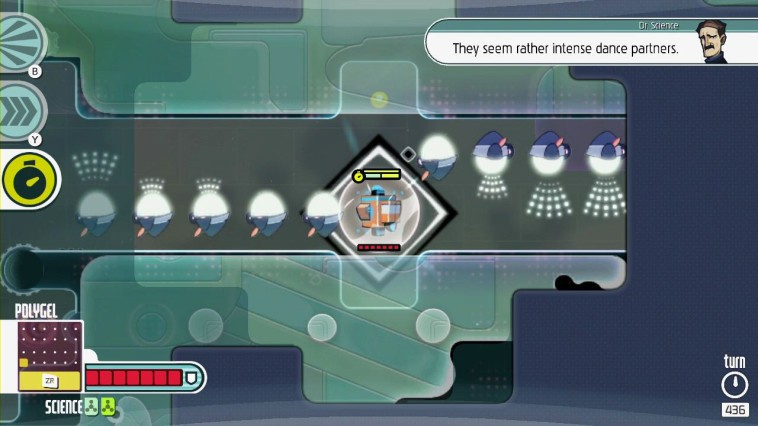 Difficulty in Nova-111 gradually increases, environments will change, as well as enemies you'll encounter; adjusting to these changes keeps things interesting and allows for some clever puzzles. There are times when the game feels easy with obvious solutions, but there are some movement puzzles that require a bit more thinking. 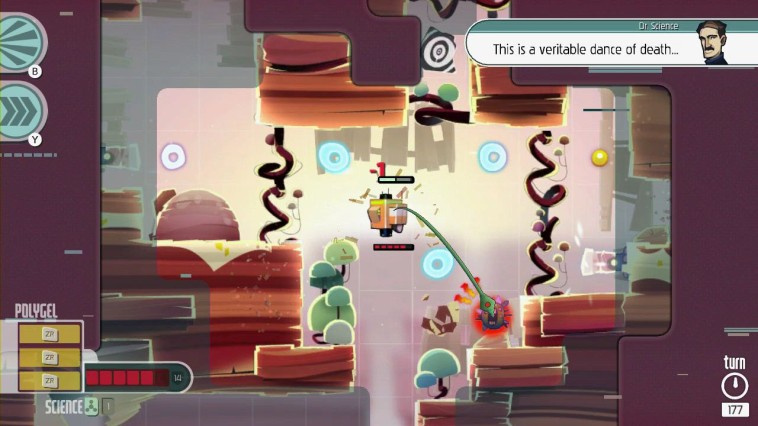 Later levels do present a lot more challenge and it's a frantic mess of a good time where unexpected mechanics are thrown in and turn your knowledge upside down. There are also boss fights which are great fun, and punishing. Overall, these add-ons and the increased difficulty are exciting and essential to traversing the hazardous but beautiful terrains and areas of Nova-111's space exploration. Visually this is certainly a beautiful game. From the space debris, caverns, fragments of a destroyed space laboratory to the creatures infesting deep space, Nova-111's art style is colourful and sharp. Even when exploring the broken space lab, or the time anomaly levels which warps space and… time, the environments pops with a vibrancy while still maintaining the dreary, atmospheric feeling in certain scenes. Cube shapes from unexplored maps cut away to reveal an interesting landscape with fascinatingly designed monsters. The entire game is framed by varying shades of these blocks, which lend to visually intriguing crafted worlds. The soundtrack to space exploration also comes with the appropriate sounds of sci-fi technological fare, or moody pieces that at times echo with synth for frantic or even beats. This amazing mini sci-fi adventure has its tense moments, with a story that's scattered in visual cues as well as through quips from one scientist - the lovable Dr. Science! - who comments on just about everything, acting as a tutorial guide but also as comedic relief. His visual pop-up comments are useful, though at times he will give too many hints as to how to proceed which aren't entirely necessarily in some obvious situations. Aside from this his humour is self-aware, breaks the fourth wall, is hilarious and perfectly implemented with some good timing and execution. He's also got a lot of mother issues which some may not or may not relate to but, at the very least, it makes this space adventure full of laughs and anything but lonely. Dr. Science gives the game a light-hearted quality for a relatively simple narrative premise. Even in its simplicity, however, it's a great one for its execution. There's a horrible experiment that goes wrong which tears a hole in the space-time rift, which is something we've heard before. But be sure to enjoy the ending and unlock the New Game+ for a bittersweet, charming twist. It's all delivered with such wit and without much fuss - which makes Nova-111 an even more layered experience when considering all it encompasses through its style and gameplay. 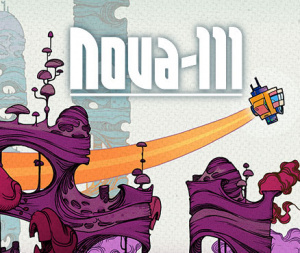 Nova-111 is a fantastic puzzle action adventure game with a world that's built with care from its beautiful colours, rich in-depth quirky gameplay to its witty humour. Each level is carefully designed - whether through dead-ends and tricky pathways to cross or find during rescue missions, or through enemies to get around, manipulate or destroy. All of these interesting approaches to turn-based movement and combat, sprinkled with real-time elements, make for a game that has a lot to offer for its clever solutions and different style. While earlier levels may feel a bit easy and there's some hand-holding throughout, the difficulty increases in later levels turn this into an experience that's a welcome challenge in puzzle solving that's mostly balanced. Overall, Nova-111 is a lot of fun for its smart mix of familiar gameplay elements. Discovering the weirdness of space has never been cooler. Got it right away. Curve digital has a great track record on the eshop. It's a shame all my time is being used up right now but this game seems really cool! what??? 9?? it is a must have. I almost got this on my Vita a few weeks ago. I think I'll get it on the Wii U instead. Well i enjoyed it in my review. It sounds like you loved it though! Just heard about this. Wow, what a surprise gem! Two indie games reviewed that get 9/10 practically in the same week? Inconceivable! I'm not one to complain about pricing and at 12 quid it's still cheap for what seems like a good game but the difference between the UK and US is a bit off.Considering how cheap we have been getting our Nintendo made games recently compared to the US due to (what I think anyway) favourable exchange rates against the Euro I shouldn't really complain.With that being the case though,what makes this one cost the equivalent of over $7 more?Especially since Curve are UK based. Edit: or maybe it's actually because of them being UK based it costs more there? I didn't know about this game, but after reading the review, I think I'll buy it eventually! I know they are quite different, but does it in any way compare to Affordable Space Adventures? @shani No, I don't think it's that comparable to Affordable Space Adventures. From what I've played from Nova-111 so far, the Wii U game that it remind me of the most is Steamworld Dig. Affordable Space Adventures is very much its own thing. @jariw Ah okay, I was just asking because solving puzzles in space reminded me of ASA. Thanks for the info! Miiverse community for this game is more dead than a graveyard. I bough it on last sale but I don't like much. 6/10 for me. The problem is flow. many times I was anxious to finish a level. and the next had not new ideas, feels tired. 1 euro in eShop now! Bought this in a sale ages ago but only just now playing it - really enjoying it!